A global tax on Wall Street speculation is a good idea whose time has come. 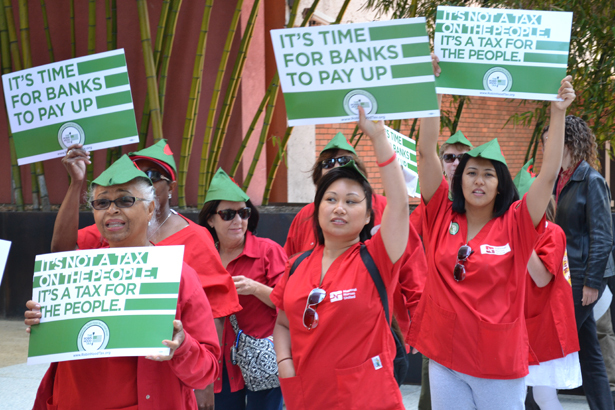 Last week, nurses rallied, bank staff marched, conservatives coalesced and finance professionals petitioned—all in support of a global tax on Wall Street speculation. You wouldn’t know it from the headlines (Financial Times: “Push for EU-wide ‘Robin Hood Tax’ ends”), but by week’s end, that elusive goal was closer than ever. As I’ve written before, the financial transaction tax (FTT) is a good idea whose time has come. By assessing a modest fee on transactions, we can raise revenue from those who can afford it while discouraging the unproductive speculation that puts our economy at risk. And frankly, Wall Street owes us. The tax offers an antidote to austerity and a rallying cry that hard-core occupiers, Democratic senators, and reality-based conservatives can all get behind. Consider the coalition of European Union countries backing the tax, led by new French Socialist President François Hollande and German conservative Angela Merkel. “We are behind where the state of the debate is in Europe,” says Sarah Anderson, who directs the Global Economy Project at the Institute for Policy Studies. Though European conservatives peddle austerity, says Anderson, they have “more of a clear understanding that governments need to raise revenue, and that this is a practical way to do it right now, when there’s such a crushing need.” While media reports have focused on the majority of EU countries that didn’t get behind the FTT at last week’s European Commission meeting, Anderson says proponents’ immediate goal was always to pull together enough countries for what the EU calls “enhanced cooperation.” They needed at least nine nations; they now have ten. Anderson expects successful implementation and new revenue in those countries will shift the debate for the holdouts, including the UK and the USA. Anderson says that the struggle for an American FTT may come to a head at year’s end, as Congress faces the planned expiration of the Bush tax cuts and the looming trillion-dollar cuts set in motion by the debt-ceiling deal. She believes grassroots energy, and the European example, can force the common-sense FTT into the coming budget debate. For more on activists behind the Robin Hood tax, click here.